This ambitious album, the culmination of Sydney saxophonist Sandy Evans’s musical career so far, is a dignified and satisfying melding of Indian music and Western jazz. It’s a complicated collaborative project brought to fruition over several years. The music is original, the compositions shared by Evans and two Indian artists, Hindustani classical music singer Shubha Mudgal and her husband Aneesh Pradhan. The album is dominated by Mudgal’s haunting vocals. Her lyrics are in a number of non-English languages, but non-Indian listeners will hear them simply as wordless vocals. 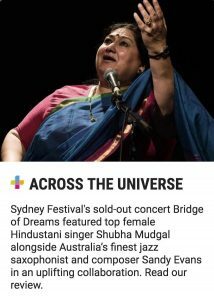 Other soloists are Pradhan (tabla), Sydney’s Bobby Singh (tabla), Sudhir Nayak (harmonium) and Evans herself (saxophones). Evans’s solos are a highlight, particularly on soprano saxophone, with a sensitivity reminiscent of Wayne Shorter. The Indian musicians were recorded in Mumbai in June 2017. A year later in Sydney the Sirens Big Band and Evans overdubbed their contributions. Evans’s arrangements are a real work of the imagination, pure jazz-oriented writing which is highly sympathetic and respectful towards the Indian contributions, enhancing and commenting on their music. Evans’s charts are played beautifully by the largely female Sirens Big Band. Indian music, without the harmonic changes found in Western music, can often sound drone-like and repetitive. On Bridge of Dreams that tendency is leavened by the jazz sensibility in operation, giving the music welcome variety. Also, the great strength of Indian music – rhythmic subtlety – survives here, never smothered by the Western drum-kit. Future musicologists will no doubt deconstruct the complicated scales and rhythmic patterns explored on this album. For the moment I hear it simply as splendid art music at a high level of achievement, and also it is accessible and very moving.